Moisture Rules: Is your pet getting enough? Is your pet getting enough moisture? See our tips to ensure your cat or dog stays hydrated. So fresh and so clean. Wash the water bowl with soap daily, and refill it with fresh water multiple times a day. It could be the bowl. Is it too big or small? Could the material be affecting how the water tastes? Consider trying a new bowl, or even a pet drinking fountain. Some dogs and cats love to drink running water! Add wet food to his or her diet. The supplemental moisture in wet food can be beneficial to pets’ health, plus it tastes great! Mix it in with dry kibble, or switch to wet food completely. And, don’t forget the wet treats, like Tiki Cat® Stix™. Location, location, location. Something close to the water bowl may be deterring your cat or dog, such as a litter box or washing machine. Try moving the bowl somewhere else, away from odors and loud noises. More water bowls. More opportunities to hydrate. Place a few extra water bowls in different areas around your home. Ice can be nice. An ice cube or two can refresh room temp water and engage a playful pet. To make it even more enticing, add a little broth from their wet food to the ice cube! Bring water with you. When taking your dog for a long walk or outing, pack extra water and a bowl for your favorite buddy. Keep it cool. Like us, dogs and cats lose moisture when they’re hot. So, make sure they always have access to places where they can cool off. 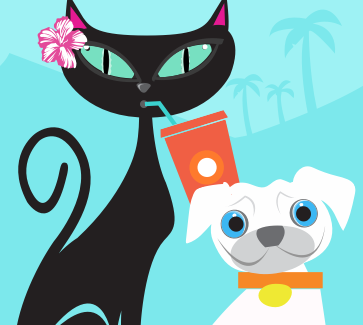 We hope you and your pets have a happy, hydrated summer! Have a tip to share? Leave a comment below!